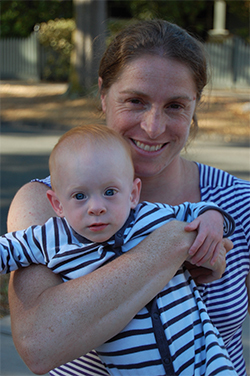 Lauren Hewitt was only seventeen and in her final year at school in 1996 when she represented Australia as a runner in the Olympic Games in Atlanta. That was the start of a twelve-year career as an elite athlete that spanned three Olympic Games, six World Championships, and three Commonwealth Games in which she won two gold, one silver and three bronze medals. Lauren loved "every minute" of her career but knew she had to prepare for life after athletics. She started a Bachelor of Science at Monash's Clayton campus in 1998, juggling study with training four to six hours a day and competing in the Commonwealth Games in Kuala Lumpur. She switched to a distance education course in second year, allowing her to undertake laboratory sessions in a block and which made studying portable. "Distance education was fantastic," she says. "They give you everything up front – all the books – and you know exactly when all the assignments are due." Being self-motivated helped. Lauren says university kept her "balanced and focussed" when she wasn't on the track. She deferred in 2000 to compete in the Sydney Olympics. "To have a home crowd of 100,000 Aussies cheering for you is a loud and amazing experience," she says. The 200-metre final in the World Championships in Seville, in 1999, was another career highlight – a personal best of 22.53 seconds and coming seventh in the world was exhilarating. After majoring in biochemistry Lauren added a Masters in Nutrition. She set up 'Lauren Hewitt Nutrition' in 2009, a year after retiring from professional competition. "I'd loved getting out there competing and travelling, but when it was time to let it go everything fell into place. Part of that was definitely having the degree behind me. "She combined her athletic and scientific knowledge to help people achieve better nutrition and improve their overall health and wellbeing, a new passion. Running the 'Growing Up with Good Nutrition' program for schools was a main part of her work. She also made presentations to companies, took workplace health and fitness programs, and conducted her own private practice. Lauren is now revelling in being the full-time mother of seventeen-month-old Isabella. "The first thirty years of my life was all track and field; now this little one is totally my priority. Compared with all the training and studying, motherhood is the most challenging and rewarding of all. I've learnt with Izzy that she is her own independent little person. Every moment I have with her is so precious."